Hockey sticks look like this _/, but the Ducks’ record this season has been looking like this L.
The Anaheim Ducks record is 30-35-9. For those who do not know that is 30 wins 35 losses and nine over time losses. This adds up to a total of 69 points in the standings. They are ranked 27 out of 31 teams, and the 7th seed in the Pacific Division of the NHL. This is one of the worst seasons the Ducks have had in recent memory. Last year the Ducks were 44-25-6. Although not a perfect record, it was much better than this year is shaping up to be. The Ducks unsuccessful season seems somewhat ironic; if you ask a Ducks fan how their team usually starts, they would tell you how the Ducks always start off shabby and later turn their season around. The irony of it all is that the Ducks started off better than they had in recent years with a 5-2-1 record and has gone downhill from there. As the season progressed, the Ducks seemed to be getting worse; being poisoned by injuries with almost all of their core players. Injuries struck players including; Cam Fowler, Ondrej Kase, Patrick Eaves, Corey Perry, Rickard Rakell and so many others. In a press conference on Jan. 11, Randy Carlyle was questioned about his job and how safe he felt with all the losses being marked on the Ducks record. Carlyle responded with with calling the reporter a “jerk” and stormed out of the press conference shockingly ending it. Even the All-Star game, was painful for Ducks fans. John Gibson, the Ducks Goaltender and All-Star game representative had an embarrassing performance by giving up seven goals. Although the All-star game is just for fun, a fan hates to see something like that happen. 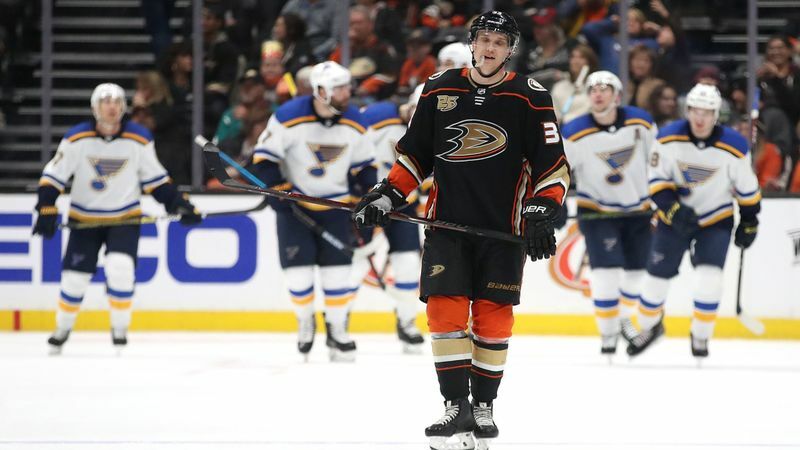 After the All-Star break, Corey Perry made an early return and almost all of the Ducks essentials with the exception of Ondrej Kase. One may expect that with the returning players they might put some wins on the board. This, however, did not happen. They lost six games in a row, including arguably the most pathetic loss of the year, losing 3-9 to the Winnipeg Jets. On social media, the hashtag “#firecarlyle” was spreading like a wildfire. In addition Ducks fans were showing up to games with frown-faced paper bags over their heads. The Ducks dropped to the 27th ranked team in the league. This question arose: how many games did the Ducks have to lose to fire Randy Carlyle? As it turns out it took 17 out of 19 games lost to make a change. On Feb. 10, Murray decided to relieve Randy Carlyle of his duties as head coach. 🗣: "I want to see them competing. I want to see emotion. I want to see them competing to win." Although it seems as though this season will be a complete failure, there is light at the end of the tunnel. In Murray’s first career game as being head coach, the Ducks’ rookie goalie, Kevin Boyle also got his first career start in replacement for an injured John Gibson. Kevin Boyle had himself a night with making 35 saves and completing a shutout against the Vancouver Canucks, ending a seven-game losing streak. After the win over the Canucks, they lost 3-0 to the Boston Bruins, however it was rather evident that their play was much better than it had been in recent games. On Feb. 17, Ducks legend Scott Neidermeyer’s jersey was lifted to the rafters in honour of his spectacular career. Subsequently the Ducks beat the NHL’s defending Stanley Cup Champions 5-2. Not to mention that Ducks goaltender Ryan Miller who started that night became the winningest American-born goalie in NHL history. Fast forward two days after; the Ducks won 4-0 against the Minnesota Wild. Unfortunately in a game against the top seed in the Western Conference, the Calgary Flames, Anaheim lost 2-1 in heart-breaking fashion: with a goal for the flames in the last three minutes. The Ducks role for the rest of this season is to play spoilers for teams making playoff pushes. For example, on March 15, the Ducks beat the Colorado Avalanche, who need to win nearly every game possible to make the playoffs. The ducks won 5-3 putting even more pressure on Colorado. Although it’s not a cup-winning year, the Ducks minor league team, The San Diego Gulls, have plenty young talent as well as the most-likely future head coach of Anaheim, Dallas Eakins. The Gulls are also ranked 7th in the Western Conference of the AHL. There is light at the end of the tunnel for the Anaheim Ducks, following this season of course.